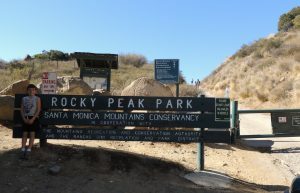 Meet at 4 PM (5 PM during Daylight Saving Time) at the Rocky Peak Fire Road trailhead. Take the Rocky Peak exit on the 118 Freeway and head north over the freeway. If there is no parking available at the trailhead, park across the bridge on the Santa Susana Pass Road.